It’s said that necessity is the mother of invention. Consequently some of the most useful products are designed for very specific situations and requirements. But that doesn’t mean these solutions can’t look terrific too, which is why when people are interested in efficient and great-looking garage organization solutions, I’m happy to suggest three different lines of cabinets – Hercke, Onex and Ctech. All of the products that Nuvo Garage carries and recommends for garage transformations are highly functional and have specialized features that will appeal to various needs, priorities and budgets. Over the next few months, I’ll get into more specific details about the unique features of each product, but this month I’m going to focus on Hercke. As the operator of an independent business, I have the luxury of choosing the suppliers and products I believe in and Hercke’s modular system is durable, functional and attractive. It’s one of my favourite storage solution systems because in addition to good design and adaptability, dollar for dollar it’s a sturdier, higher quality product than similar systems offered by home improvement retailers. Is there a gauge distinction between big box cabinets and these? 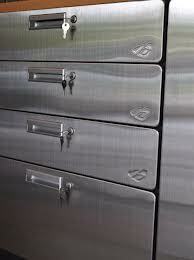 The fully lockable system includes 30-inch wide steel cabinets with black cases and black shelves. They can be personalized with stainless steel or powder grey fronts that work extremely well in a garage storage setting and can also be utilized in other areas of your home for storage system continuity. Another key feature is they have scalable legs, which ensure that the cabinets can be levelly installed to retain their integrity even with the 5% grade slant on garage floors, a building code requirement that ensures proper water run-off. Hercke cabinets work effectively because their storage and organization system was created by homeowners with needs that are likely quite similar to yours. The company was founded by the husband and wife team of Tom and Katy Van Hercke when they were unable to find adequate storage solutions to keep power tools out of the reach of their two young children and Katy wanted to store some over-sized platters and trays in the kitchen. Their breakthrough was developing a system that was functional in the garage or basement, but also flexible and attractive for other areas of the home including the kitchen, laundry room, office or playroom. The other important component was they wanted the design to be appealing for both men and women. It is. 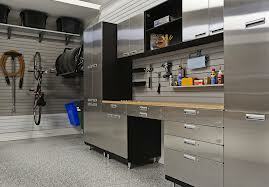 And that kind of aesthetic appeal and continuity is handy to get consensus on a project like transforming the chaos of your garage into an attractive place of highly organized storage, safety and efficiency. As a consumer, you have a is a range of options, but I believe that customized Hercke cabinets are a far better value and long-term investment than a lot of lower priced, and consequently lower quality substitutes out there. Plus, Nuvo Garage offers full-service transformations from the design and sourcing through installation that can be completed in a few days once specialty orders have been placed. For a consultation and estimate, give me a call.